Manager Paddy McLaughlin believes Institute owe themselves a performance against Linfield, when the sides meet at the Ryan McBride Brandywell Stadium on Saturday. ’Stute have already suffered two defeats to the Blues this season and McLaughlin, who was quick to praise the Belfast men, wants a response from his players tomorrow afternoon. In those two games McLaughlin’s side were second best - having lost at Windsor Park by 3-0 and 5-0 respectively. “It’s Linfield coming to the Brandywell, so there’s no motivation needed,” he insisted. “We have played them a couple of times already this year and they were top-drawer. “If anything, we owe ourselves a performance against them as they are the only team that we haven’t really played well against. “In almost every game this season we have held our own, apart from the Linfield games, so we owe ourselves a performance against Linfield. After having a virtually fit squad to choose from last weekend, it’s a different story heading into the game against David Healy’s side, as Aaron Harkin, Jake Morrow and Ryan Morrow are all missing. “Aaron missed last week’s game at Dungannon, because of a chest infection, so he won’t make it,” he confirmed. “To be honest, he has been struggling with the chest infection for a weeks and after visiting his doctor again on Monday he has been given antibiotics. “So, after resting all of last week he has been told to rest again this week, so he’s out. McLaughlin also knows the encounter against David Healy’s side will not just be a big occasion for his side but a big occasion for the city. “Look it’s a big occasion, because Linfield are one of the biggest clubs in the North, in fact probably the biggest,” he added. “Linfield are always going to have that prestige and that big high profile about them. “So coming to the Brandywell is always create that big of attention. 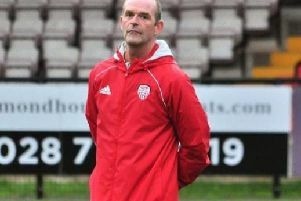 “But the way the games have panned out at the Brandywell so far they have all gone really well. The Blues suffered their second league defeat of the campaign last week, losing to Coleraine, but Healy isn’t down in the dumps. “Nobody outside of Linfield is going to feel sorry for you, or no-one inside Linfield is going to feel sorry for you either for that matter,” he stated. “The Windsor Park dugout is a tough place at times, but I’m a strong enough person to get through it. “Yeah it was a down day on Sunday, but since the start of the week I’m ready to go again making sure the boys are ready to face Institute on Saturday.